It's February, it's sunny, at the moment anyway, and I finally feel like the growing season has begun. So I thought it was time to work out what vegetables I plan on growing, and plan the vegetable bed rotations. 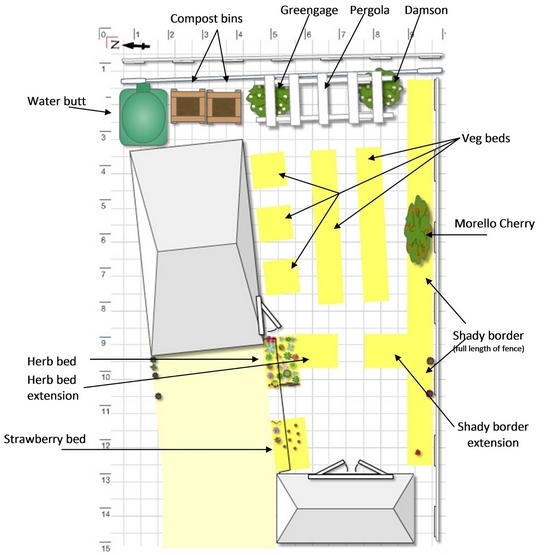 You can see above where the vegetable beds fit into the overall garden design. 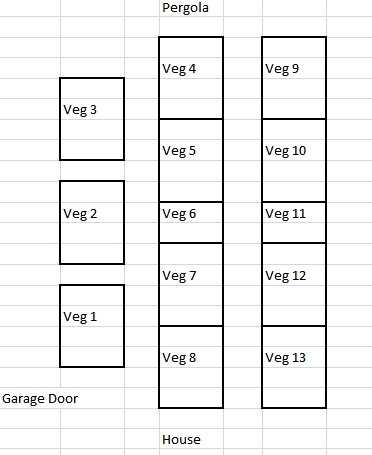 And below is a layout of how I'm dividing up the beds for crop rotation. Most beds are 1m square, except for beds 6 and 11 which are 50cms square. The odd size is simply because I couldn't quite fit in 5m long beds, so went for 4.5m long beds. I am squeezing as much out of the space I can, even if it means slight odd bed sizes! I have planned for a 4-year crop rotation. There are a lot of ways that you can plan your crop rotations. You could do a simple: brassicas, potatoes, legumes and roots, the latter including onions and garlic. You then plant everything together within their respective families, so with potatoes you could place tomatoes and aubergines, and in brassicas you would include cauliflowers, Chinese greens, brussels sprouts and kale. I've gone for something that is more detailed, as I also want to plan for what beds get the most sun. Beds 1 - 8 will get sun for a longer period (an extra 2-3 weeks at least) than beds 9 - 13. So I wanted to ensure that plants that need more sun, such as tomatoes, aubergines, squash and courgettes were to be rotated within the sunnier borders. As beds 4 - 8 and 9 - 13 and parallel to each other, I'm going to create arches between some beds each year to extend how many climbing beans I can get in. So in 2014 I will be planting legumes in bed 4, with the climbing beans at the right side edge, so I can put in arches (using canes) over to the parallel bed 9 and grow more beans on the left edge of that bed. An added bonus is that this should also look pretty with the temporary arches and bean flowers and pods hanging down. I also intend on throwing in some poppy, calendula and cornflower seeds into the vegetable beds, randomly, to add more prettiness(!) and to attract pollinators. In the future, I plan on bringing the west-facing front garden into production. This gets quite a lot of sun all year around, even in winter, so will give me even more beds and yields to play with. I probably won't be starting on that until 2015, as I really want to focus this year on getting the back garden into production, with both vegetables and fruit, as well as flowers. So the crop rotations are sorted. On with the seed sowing. Excellent layout and nicely detailed. Thanks for this. I have never tried rotating the crops when I plant new ones since I always get a good yield. Might try this in the future and see what it brings me. One of the main reasons for crop rotations is to reduce the chance of disease. In a smaller garden it's not as much an issue, but when you have a larger garden or allotment, you are growing lots more so there is more chance for disease to develop. The other main reason is that different crops have different needs/nutrients. So peas & beans put nitrogen back into the soil, brassicas take it out. So by rotating you take advantage of those benefits and depletions.